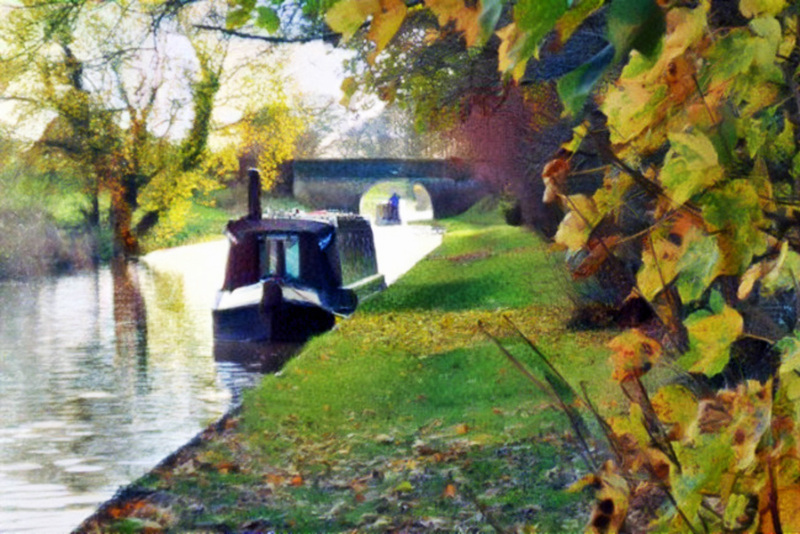 Ice and a slice #England #narrowboat #winter – The Diesel-Electric Elephant Company. Yesterday presented itself as quite the perfect boating day. Someone spilt blue all over the sky, the sun had been lit (probably by accident) and the wind altogether forgot to turn up for the party. The Cardinal and I had many, many fine things that needed to be done. We done ’em. As ever, it wasn’t quite the straightforward “run up the lateen crab-claw and hold out your pocket handkerchief, Mr Christian” procedure. Oh no. We, that is to say, I needed services – a dash of main tank water, some potable water, the disposal of rubbish and recycling, a spot of gazunder emptying and mayhap a little diesel into the mix if you have a good vintage. The nearest services, Aqueduct Marina, were some hundreds of yards behind us and through one of those narrows made by a removed bridge. Too far to reverse with any dignity. The nearest winding hole lay some miles ahead. Nowt for it, the plan was to take advantage of this mistake in the weather, hoof up to the winding hole, hoof back to the services and thence back once again the way we’d boldly gone once already, onwards to pastures slightly new. All in all the route was some six and a half miles in a big squiggle, to achieve one and a half miles moved on the canal… Still, it was a fine day for messing about in boats. I made ready. Stove flue pipe down flat, lighting mast laid flat, covers off, waggle-stick extension on the tiller, fenders up, engine running and lines untied. Not a single other boat disturbed the bird-tweety, squirrel-foraging peacefulness of it all right up to the winding hole and almost back to the marina… when just as I had committed us to the turn through the narrow entrance (why do they always have such narrow entrances?) a boat appeared coming straight at us like a battleship on a mission. I continued my turn anyway, and left them floundering in my wake. Oh, we did that thing at each other the way the Italians do – the flicking of the chin, the thumping of the inner-elbow, and I dropped my breeches and showed them what the full moon thought of their protestations, and then we each went on our merry way. They to who cares where, the Cardinal and I to the services pontoon. The chandlery where the practical chaps live was closed for “stock-taking”. There was a note on the door suggesting that the foolhardy and adventurous of spirit might care to try their luck at the marina reception. I tried my luck. Diesel, please, a splash of your sluice room, the use of your bins and, if it please thee, a hosepipe in the water tank by your leave. They have a pet goose at Aqueduct. It has “angel wing” and cannot fly, this in spite of its parents and a pair of swans attempting desperately to teach it how. Some people it likes, some it dislikes. Apparently, I was quite the alright type, and the young goose padded about watching my every move. I bear the seal of goose-approval. This is better, much better than the goose of seal-approval. Of course, by the time our various tanks were empty or full as required, Mr Wind had got himself up and about, and was blowing in quite the wrong direction. Marinas, even in winter, are inhabited by a million curtain-twitchers, all quite rightly looking for the least excuse to run out and load their stern-chasers with grape and chain if anyone manoeuvres too closely to their moored boats. My only chance was a couple of lengths of reverse with the throttles set to “mucho gusto”, hoping that Mr Wind didn’t do horrible things with the bow before I could get it into the lee of the boats moored in the centre, and then a tight forward turn with the throttles set this time to “I have thirty-eight horsepower and I’m not afraid to use seven or eight of them”, and at that while paddling the tiller for extra effect like a Chinese chap working a sampan. It worked, and we exited the marina – just – with dignity. The trip back up the canal, going boldly where we’d gone once already that morning, was quite splendid, with the trees sheltering us most of the way. Of course, I haven’t yet mentioned the temperature, and sunny though the day was it didn’t really get meaningfully above freezing. Indeed, several squirrels observed leaping around on the towpath were most definitely in search of their nuts after a night in the tree branches. Thus, when the time came to make first serious use that day of the centre-line rope… I had quite forgotten what torrential rain does when at or below zero Celsiums of the Fahrengezundheit scale. Oh gosh, said I, my my my, whatever have I done to my epidermis and beyond? Mummy, Daddy – why is my blood not blue, as Nanny so often said it ought? Well, no matter, we are bunkered and here at our next stop for a few days. Tis not the most scenic of moorings, but it was the first I found without the dratted, notorious, infuriating “Shroppie shelf” (an underwater obstruction preventing boats from approaching the towpath), and was there (here) when I needed to pull in because knackered is as knackered does, as my old Probation Officer used to say. Here’s a quick and amateurish look around… including a quick giz at the Cardinal’s roof accoutrements and wotnots. I have that brief feeling of those tanks that should be full being full, while those that ought to be empty being empty. Most splendid indeed. We shall hoof on a bit farther in a couple of days, I have needs of a town with some shops, so that I can avoid towns and shops in the thick of the fast-approaching uber-silly seasons, when I shall be hibernating. For one thing, I need several pairs of tactical gloves, so that next time I handle a frozen rope without thinking it’ll be the rope that comes off worst. We also look now for the attentions of the fuel boat, coal and gas for the supply of. Meeting the fuel boat is an elegant navigational ballet, since I am moving and they are moving, and it is up to me to be at a time and place where they will pass. This too will come to pass, if it knows what’s good for it. At the moment I am burning something peculiar called “Supertherm”. It is peculiar because it produces more mass of ash than I shovel in of coal briquettes. How it manages that trick I’ll never know. No, five extra 25kg bags of Excel if you please, sir, and I’ll store them in the shower if needs be. I have a feeling that this winter is going to be one lived to the rhythm of some weather or other, taking advantage of every relatively calm day, cold or otherwise. Fantastic photographs, so beautiful. Great blog, so interesting and rather awe inspiring. I am adding serious gloves to my when I live on a narrowboat list. I cannotimagine being without a pair of gloves! You had better buy some, quick sticks. I watched the film on full screen and thought it lovely. The Cardinal looks so very smart. Lovely! But wasn’t Aqueduct Marina Troy Tempest’s silent friend? Complete with flicker log – where do you get those musicians from at short notice? I was surprised you hadn’t already got the gloves for the job, hope you heal well. Another wonderful piece! Marina – the only cartoon character that inspired a Morris car… 😉 Gloves I have a-plenty, just not armoured-gloves, which is what is are needed here! As soon as I can, I shall and then we’ll see who’s all slicey!